Argentina's nuclear regulator has issued a licence to Nucleoeléctrica Argentina SA (NASA) for the commercial operation of the second unit of the Atucha nuclear power plant. The 745 MWe pressurized heavy water reactor has been operating on a conditional licence. In December 2015, the Autoridad Regulatoria Nuclear (ARN) granted NASA a conditional operating licence for Atucha 2 - also known as the President Néstor Kirchner nuclear power plant. At that time, it set a deadline of 29 May 2016 for the operator to meet all the conditions for a full licence to be issued. On 26 May, following the completion of a program of testing, training and other actions, ARN granted a full operating licence to NASA. A ceremony was held at ARN's headquarters in Buenos Aires the following day to mark the award of the licence. The ceremony was attended by representatives from ARN, NASA, the ministry of energy and mining, the National Atomic Energy Commission (CNEA) and fuel fabrication company CONUAR. 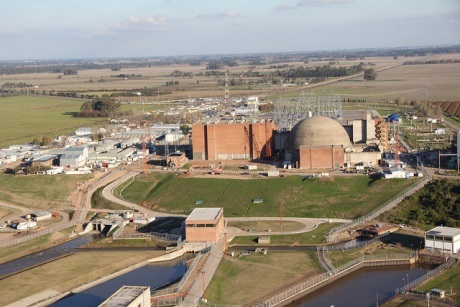 In a statement, ARN noted the issuance of the licence marks a milestone for Argentina as no new nuclear reactor has been put into operation since 1983 and all relevant players in the licensing process for Atucha 2 are Argentinean. ARN chairman Nestor Masriera said, "The important thing is that we have completed the licensing process by putting this plant into full operation and have granted an operating licence under well-documented conditions, with the confidence of having on the table all the safety requirements that meet our regulatory standards and international standards." Atucha 2 - located in the city of Lima, Zárate, 115km from Buenos Aires - was ordered in 1979. It was a Siemens design, a larger version of unit 1, and construction started in 1981 by a joint venture of CNEA and Siemens-KWU. However, work proceeded slowly due to lack of funds and was suspended in 1994 with the plant 81% complete. In 1994, NASA was set up to take over the nuclear power plants from CNEA and oversee construction of Atucha 2. In 2003, plans for completing Atucha 2 were presented to the government. The government announced a $3.5 billion strategic plan in August 2006 for the country's nuclear power sector, including completion of Atucha 2. The unit was effectively completed in September 2011. First criticality was achieved early in June 2014, and grid connection was later that month, with full power in February 2015. Together with Atucha 1 and the reactor at Embalse it establishes Argentina's total nuclear generating capacity at around 1627 MWe. The Carem small reactor project should add a further 27 MWe by 2018. The country's next two reactors are likely to be built by China National Nuclear Corporation.